New York, New York – so good they built it twice! New York New York is one of Las Vegas’s many themed hotels. 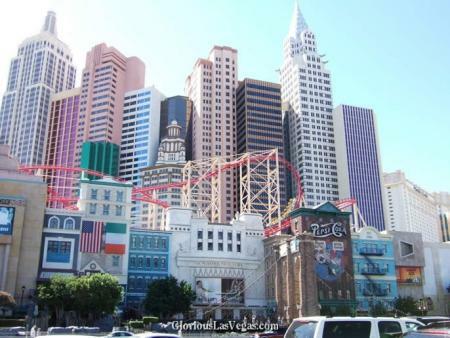 Situated on the south side of the strip directly opposite the MGM Grand, New York New York features a scale replica of the Manhattan skyline, but with one slight difference – a giant rollercoaster twisting its way amongst the skyscrapers! I’ve always liked New York New York. Not only does it look great, it’s got a great vibe inside – a real party atmosphere, which seems to be present wherever you go (particularly in the bars and clubs!). Check out our review of the New York New York hotel, and also check out our new New York New York photo gallery to see just what I’m on about. © 2019 Glorious Las Vegas. All Rights Reserved.